The automotive chassis systems market is facing a growing demand for lighter and stronger chassis systems. Chassis system made of composite components which would make the chassis lighter and stronger and aerodynamic are some of the key factors in driving the automotive chassis systems market. Light weight and aerodynamic chassis system also enhance the fuel efficiency of the vehicle. Companies manufacturing automotive chassis systems constantly invest in research and development activities for the purpose of innovating new composite materials, which are a mixture of more than one element and are stronger and lighter than traditional components. These chassis systems are much lighter in weight and safer than ordinary chassis systems. Reduction in weight significantly enhances the fuel efficiency of the vehicle. Thus, innovation of this new type of composite material for the manufacture of automotive chassis system is a major driver for the automotive chassis system market. Polymer Matrix Composite, Metal Matrix Composite and Ceramic Matrix Composite are some of the composite materials that have been recently used in the manufacture of chassis components. Safety of the passengers traveling in the vehicle is constantly improving with time. Usage of better composite materials increasingly makes vehicles safer and lighter than before. Companies are constantly focusing on research and development to improve the design of the vehicle chassis so that it is better equipped to handle the impact at the time of the crash. Added protection is provided with the help of beams to the areas in chassis which are more prone to impact at the time of crash. Furthermore, manufacturers are focusing on innovating components with higher resistance to deformation. Constant improvement in safety of the passengers traveling in the vehicle is expected to be a key opportunity in driving the automotive chassis system market. Based on the types of vehicles, the automotive chassis system market has been segmented into passenger cars, LCVs, ICVs, HCVs, off-road vehicles, construction equipment vehicles, defense vehicles, and farm tractors. The passenger cars segment held the largest share of the automotive chassis system market in terms of revenue in 2014. Off-road vehicles such as dirt bikes and ATVs are popular among adventure lovers in North America and Europe. Furthermore, several sports activities are organized globally. This boosts the demand for off-road vehicles. LCVs was the third largest segment of the automotive chassis system market, as these are the most preferred type of vehicles used for commercial purposes. Heavy commercial vehicles, also known as multi-axle vehicles, have overall payload capacity of above 16.2 tons. These vehicles are the lifeline of commercial activities and form an integral part of the economy. Emerging economies such as India and China have been experiencing rapid infrastructure development over the past few years. This has increased the demand for HCVs to transport heavy construction equipment and materials. Demand for HCVs is high for the transportation of heavy goods across long distances in the manufacturing and construction sectors. These are the major factors driving the HCV segment. 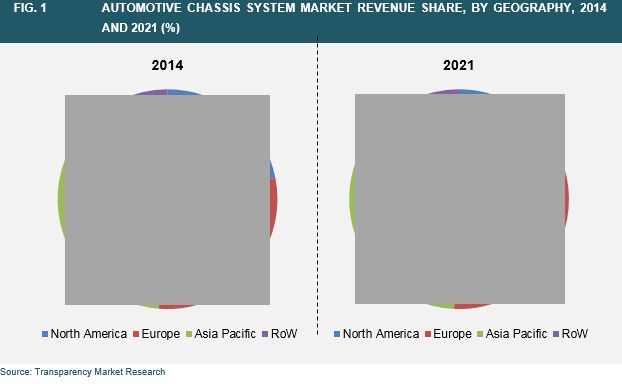 Geographically, the global automotive chassis system market has been segmented into four major regions: North America, Europe, Asia Pacific and Rest of the World (RoW). Europe dominated the automotive chassis system market in 2014. Asia Pacific is the most attractive region in the automotive chassis system market. Presence of countries like China, India and Japan is driving the market in the region. The development of the real estate industry has fueled the demand for heavy vehicles in the region. Moreover, the rise of the business class in the region is driving the demand for luxury and premium segment cars. China and India enjoys a distinct competitive advantage in terms of quality and cost and this has prompted all the major players in the automotive industry market to setup their manufacturing facility in the region. This is expected to drive the automotive chassis system market further in Asia Pacific. Some of the major players operating in the global automotive chassis system market are Continental AG (Germany), Robert Bosch GmbH (Germany), American Axle & Manufacturing (U.S.), Benteler International AG (Germany) and ZF Friedrichafen (Germanys). This report provides strategic analysis of the global automotive chassis system market and the growth forecast for the period 2014 to 2021. The report covers competitive analysis of various market segments based on components, chassis system and vehicle type and an in depth cross sectional analysis of the automotive chassis system is provided across different geographic segments.